View More In Personal Organizers. 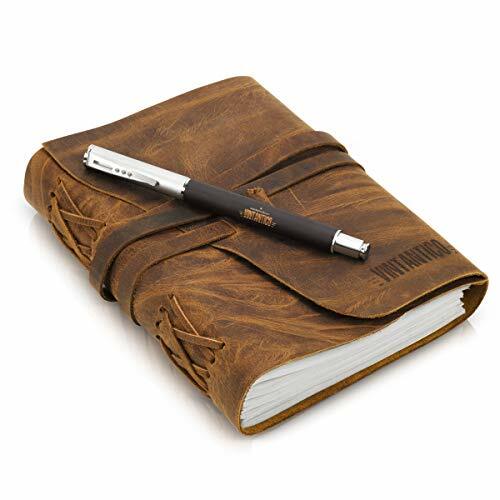 Keep a personal diary, track your daily health and wellness, or enjoy sketching and drawing in your very own leather-bound journal made for adventurous people. Whether you’re a writer, artist, or just like staying organized, a journal is one of the most important accessories to have around; especially when it’s as unique as you are! That’s why we created the Vintantico Genuine Leather Journal, a premium all-purpose journal with 240 sheets of doubled-sided paper perfect for drawing, sketching, writing, keeping notes, leaving messages, and storing all your personal secrets. Designed for home use or regular travel, this durable, yet trendy 5” x 7” notebook is the perfect size to keep in your bedroom side table, a school backpack, or even your travel carryon. And because it comes complete with a high-quality black ballpoint pen, a bookmark to keep your page, and a premier gift box to give it as a gift to a friend or family member, it’s the perfect choice for someone special in your life. Click ‘Add to Cart’ now to get this genuine leather journal for yourself, a friend, or a loved one who enjoy writing, keeping track of important events, or just doodling creative pictures! VINTAGE LEATHER COVER - These authentic soft leather-bound journals are made with premier craftsmanship ensuring each tanned binding has its own distressed look! RECYCLED COTTON PAPER - Inside each brown leather journal are 240 double-sided pages crafted with acid-free, off-white paper that won't let pens bleed through. HOME & TRAVEL PERSONAL USE - An ideal choice for writers, artists, scrapbooking hobbyists, record keeping, diaries, or as a personal journal for men and women. THE PERFECT GIFT - Every rustic leather journal notebook also comes with a stunning ball point pen, page-keeping bookmark, and premium gift giving box. WRAP AROUND BINDING STRAP - Each rustic real leather journal with hand-cut cover and hand-stitching binding also features a charming leather strap binding to close it. If you have any questions about this product by Vintantico, contact us by completing and submitting the form below. If you are looking for a specif part number, please include it with your message.